Kleber Santos (left), retail and direct bank president at Capital One, visits with student ambassadors at Capital One's student-run branch at Parkdale High School in Prince Georges County, Md. Banks have done a lot to become less physically intimidating over the decades. The Doric stone edifices and teller cages have been replaced by floor-to-ceiling glass windows and roving universal bankers who work on a tablet. Some banks have even turned branches into coffeehouses. But for someone who has never had a bank account, a bank can still be an intimidating place. Financial products and terminology are sometimes unfamiliar even to seasoned bank customers. Unlike alternative financial service providers like check cashers, banks rarely have a “price list” posted in the lobby, points out urban policy scholar Lisa Servon. Even the suits and ties that many bankers wear can make a potential customer feel out of place, according to surveys of the unbanked conducted by the FDIC. To make financial services a little less intimidating, many banks start with youth—through the programs of the ABA Foundation, for example. (Teach Children to Save, celebrated every April, brings 12,500 bankers each year into classrooms for financial literacy lessons.) But an even more powerful force is turning the students themselves into ambassadors for healthy financial choices. 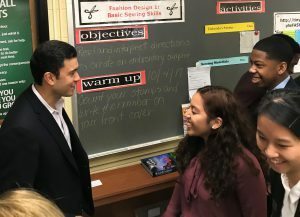 Kleber Santos (left), retail and direct bank president at Capital One, visits with student ambassadors at Capital One’s student-run branch at Parkdale High School in Prince Georges County, Md. Capital One today operates four high school branches: one each in the Bronx; Manhattan’s Harlem neighborhood; Newark, N.J.; and Prince Georges County, Md. 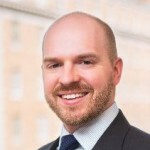 The first branch opened in the Bronx in 2007, where some employees at North Fork Bank (later acquired by Capital One) had been active teaching financial literacy. By opening a branch there, the bank complemented the financial literacy program by having “students put what they learned into practice by opening a bank account at a bank branch in their school,” Williams explains. Each Capital One campus branch is staffed by 10-12 “student ambassadors” plus one dedicated Capital One full-time employee to oversee things. The branches are open three days per week, four hours per day. The branches, which include a small teller line and desks for relationship bankers, range from 300 to 700 square feet and fill any space the bank can find: storage, unused offices, even an old wood shop. For Julieann Thurlow, president and CEO of Reading Cooperative Bank—a $562 million mutual in Reading, Mass.—the two high school branches Reading Coop operates help them generate a sticky relationship with students as long-term customers. Capital One also pairs its on-the-job training with a strong college prep component, providing a college consultant for their student ambassadors. Thus far, 94 percent of program participants are going on to college, and they have an option to continue on part-time with Capital One if they go to college in the bank’s footprint, according to Williams. She adds that the bank is “looking to hire diverse students in the program,” including those “who may need a second chance.” Williams recalls one young woman who was selected for the program even though her grades weren’t as strong as some of the other candidates. Working in the in-school branch program helped her transcend a tumultuous family background, and she went to college and now works as an account executive at a major social media company.